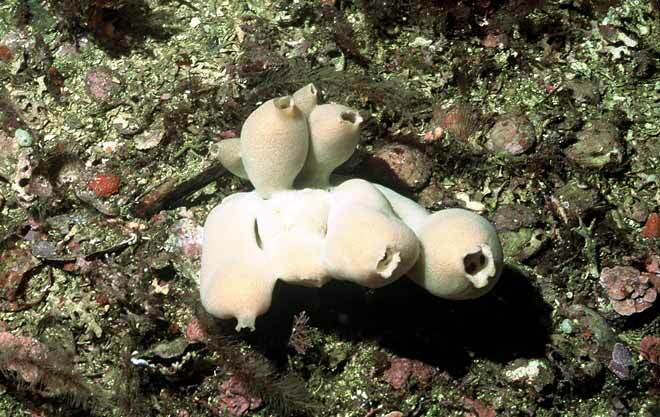 Forming urn-shaped growths connected by a common base, vase sponges (Leucettusa lancifer) are members of deep reef communities. They are found at depths of about 20 metres and grow 8–10 centimetres high. These fragile animals are pure white or tinted pink. Sponges have a unique way of feeding, taking in water through tiny pores, filtering out nutrients and expelling the filtered water through large openings. These openings are visible in the two vase sponges to the right.